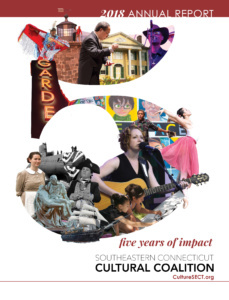 This Five Years of Impact annual report reflects both 2018 and the first five years Southeastern Connecticut Cultural Coalition’s enormous growth and impact in the region. Our five years of events and activities helped to raise the profile of arts and culture and the entire creative sector both in the region and in the state. As we continue to evolve and grow, we are deeply grateful for the tremendous local, regional and state support of our organization. We look forward to sharing many more annual reports with you.